The St Andrews School of History is pleased to announce that the 2014 T.C. Smout Lecture in Scottish History will be delivered by Professor Christopher A. Whatley. Professor Whatley is Emeritus Professor in Scottish History at the University of Dundee, where until recently he was Vice-Principal. He is a Fellow of the Royal Society of Edinburgh and author of an acclaimed series of books and articles on modern Scottish history, notably Scottish Society, 1707-1830 : Beyond Jacobitism, Towards Industrialization (2000) and The Scots and the Union (2006; revd edn 2014). The lecture will take place at 5:15 on Thursday 2 October in the Arts Lecture Theatre at the University of St Andrews, on the title of: “Burns by an Englishman is impossible”: sculptors, statues and the contested memory of Robert Burns. Britain, it has been said, went ‘statue mad’ in the Victorian and Edwardian eras. In Scotland (and North America) numerous statues of Robert Burns were erected. This lecture will explore the reasons for the surge of enthusiasm for permanent memorials of a poet who had died in 1796. What will also be revealed are the personal, ideological, and aesthetic tensions that characterized many of the statue building projects, and the furious – and frank – debates that followed as towns and sculptors vied with other to erect a fitting monument to the ‘Poet of the Scotch’ during a period of political reform, urban improvement and intensifying Scottish national sentiment. The lecture will be chaired by the University Principal, Prof Louise Richardson. The inaugural T.C. Smout Lecture, delivered by Professor Fredrik Jonsson, can be listened to here. The School of History is delighted to announce that Kelsey Jackson Williams has been awarded a British Academy Postdoctoral Fellowship, to be held at the University of St Andrews from 2014 until 2017. Dr Jackson Williams works on antiquarianism, the early modern study of artefacts, manuscripts, ruins, and other fragments of the past. His project, Writing Scotland: Antiquarianism, Confessionalism, and National Identity in Early Modern Europe, looks at a series of seventeenth- and eighteenth-century Scottish antiquaries whose efforts to recover Scotland’s textual heritage – whether in the form of medieval chronicles, Neo-Latin poems, or humanist treatises – were central to the formation of a national literary canon. They were not, however, entirely disinterested: the project will recover their confessional, political, and regional allegiances and investigate the pressures those placed on their scholarship. This builds on Dr Jackson Williams’ previous study of the intersection of antiquarianism and canon formation and he hopes that it will significantly advance understandings of both. Dr Jackson Williams’ first book, soon to be forthcoming, examines the writings of the antiquary, scientist, and biographer John Aubrey (1626-1697). After completing his doctorate at Balliol College, Oxford, he taught at Jesus College, Oxford. He will be joining the School of History in September 2014 and will also be a member of the Institute of Scottish Historical Research. St Andrews historian Dr Michael Brown – who researches late medieval Scotland during the Wars of Independence and its aftermath – will be leading discussion at a workshop in May. Michael Brown’s recent books include Bannockburn: The Scottish War and the British Isles, 1307-1323. In the run up to September’s referendum, the School of History, Classics and Archaeology at the University of Edinburgh is hosting workshop on identity, independence, and interdependence in historical perspective. Drawing on a range of disciplinary approaches and evidence from a variety of places and periods (from the prehistoric to the modern), this one-day meeting will examine the relationship between a community’s sense of identity and its political independence. Dr Michael Brown will be joined by Professor Ewen Cameron (University of Edinburgh) and Dr Alison Cathcart (University of Strathclyde). Attendance is free and all staff and postgraduates, but interested parties are asked to please register their attendance by 15 May. Dawn Jackson Williams, School of History communications intern and associate of the ISHR, attended the annual ISHR Reading Weekend. Below is her account. The Burn. (Photo credit D. Jackson Williams). The weekend of the 21–23 March saw members and guests of the Institute of Scottish Historical Research head to the Burn, just south of the Cairngorms National Park, where they enjoyed three days encompassing a variety of presentations, historical discussions, and a field trip to learn about Pictish stones. Following a mid-afternoon arrival on the Friday the group was given plenty of time to get acquainted over tea in the Burn’s beautiful Drawing Room. After dinner, the MLitt students in attendance kicked off the weekend’s presentations with a ‘Three Minute Thesis’ session. The six gave brief introductions to their areas of research, which ranged from an exploration of the queenship of Margaret Tudor to a study of Scottish music halls in the early twentieth century. The postgraduate focus of the evening continued in a more light-hearted vein as Claire Hawes demonstrated herself to be not only a talented historian, but also a brilliant musician; she treated us to a musical exposition of the highs and lows of PhD life, set to the tune of ABBA’s ‘The Winner Takes It All’. The next morning saw two fascinating panels, featuring PhD students Sean Murphy, Carol Bailey, Liz Hanna, and Claire Hawes, which covered a range of topics including ‘verbal tartanry’ and its role in Scottish diasporic culture, the language debates of the eighteenth and nineteenth centuries, James IV and his uses of chivalry, and the nature of fifteenth-century urban communities. After lunch the group ventured to Pictavia, a nearby attraction boasting a collection of Pictish stones, where they enjoyed the commentary of an extremely knowledgeable guide, and – perhaps less cerebrally – the interactive nature of the exhibit which encouraged visitors to run their hands over replica Pictish stones, and to play a reproduction Pictish harp. The ISHR was also pleased to discover a reference to the research of Dr Alex Woolf in pride of place on the wall beside one of the opening exhibits. The two articles of particular relevance to the displays at Pictavia can be found here: ‘Dún Nechtáin, Fortriu and the Geography of the Picts’, and ‘Pictish matriliny reconsidered’. 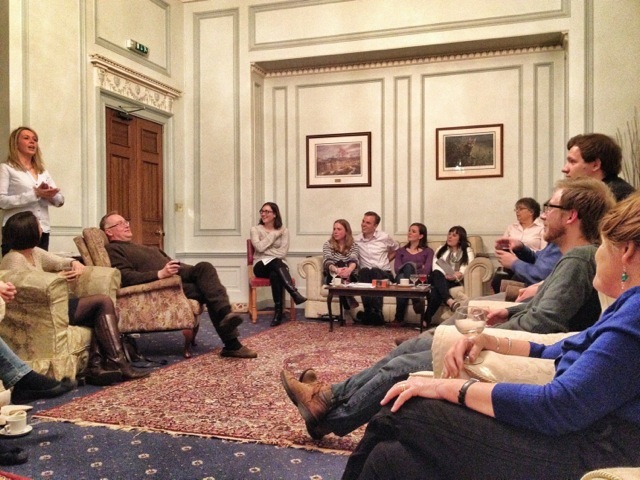 Hearing about the MLitt research topics in the Drawing Room of the Burn. (Photo credit Darren S. Layne). On returning to the Burn the group reaped the benefits of a pre-dinner skills panel, with Matt McHaffie sharing his experience of finishing the PhD, and offering advice to those PhD students present to whom handing in still felt like a distant dream. Darren Layne gave a persuasive presentation regarding the virtues of Evernote and its potential benefits for historians. The schedule for the weekend (arranged by ISHR intern Amy Eberlin) had boasted ‘Prescribed Fun Time’ for the hour or so after dinner, and the inaugural ISHR pub quiz certainly provided both entertainment and some head-scratching. History as a potential category was deliberately avoided and the assembled staff and students were tested on their general knowledge, geography, and, in a picture round, their ability to recognise the logos of international organisations. The ‘Blue Owls’ helmed by ISHR Director Katie Stevenson won, although as they boasted a one-time St Andrews University Challenge team-member, this had been widely predicted. The team of ISHR’s Edinburgh guest, Steve Boardman, came joint last after forgetting that the Queen was Canada’s head of state. The final day saw some erratic weather – bright sunshine interspersed with hail – but no change in the continuing high standard of presentations across the weekend. Piotr Potocki explored Catholic identity and the Catholic church in Scotland in the late nineteenth and early twentieth centuries, whilst Neil McGuigan took listeners on a journey to the ninth and tenth centuries with his account of the sons of Ivar and the medieval kingdom of Northumbria. The weekend was ably rounded off by Dr Steve Boardman, who gave a compelling paper on the depiction of Anglo-Welsh and Anglo-Irish relations as depicted in Scottish sources. After a final lunch, the group dispersed, perhaps a little more tired, but certainly more knowledgeable than they had been upon arrival. Amy’s love for history began at a young age. Her schooling was littered with projects about important historical figures from Florence Nightingale to Eleanor of Aquitaine. While she enjoyed history, Amy entered Denison University in 2007 as an International Studies and Communications double major. This did not last long. In the second semester of her first year, Amy took a class on twentieth century history through literature. She was a goner. The next three years were filled with every history class that she could get into, particularly medieval European and modern African history classes. As a product of her liberal arts education, Amy’s research interests ranged from the socio-political identity of religious military orders in medieval England and France to the efficacy of judicial systems in post-genocide Rwanda. Shortly after she completed her BA in History with a minor in Sociology/Anthropology in May 2011, she began a MLitt in Medieval Studies in Aberdeen. She attained her MLitt in Medieval Studies in 2012 under the supervision of Dr Jackson Armstrong. While at the University of Aberdeen, Amy developed an interest in the social and political history of fifteenth century Scotland. This enthusiasm for late medieval Scottish history led her to the University of St Andrews in 2012 and the Institute of Scottish Historical Research (ISHR). Amy’s doctoral project is part of the Scotland and Flemish Peoples Project. Her research is supervised by Dr Katie Stevenson. Her thesis argues that there was no substantial Flemish settlement in Scotland after 1347, as has previously been thought, and instead sophisticated networks of Scots with interests in Flanders emerged to deal with the increasing volume of trade and diplomacy between the two regions. This thesis will contribute to the limited historiography on late medieval Scotto-Flemish relations and, more generally, on Scottish diplomacy in the fourteenth and fifteenth centuries. 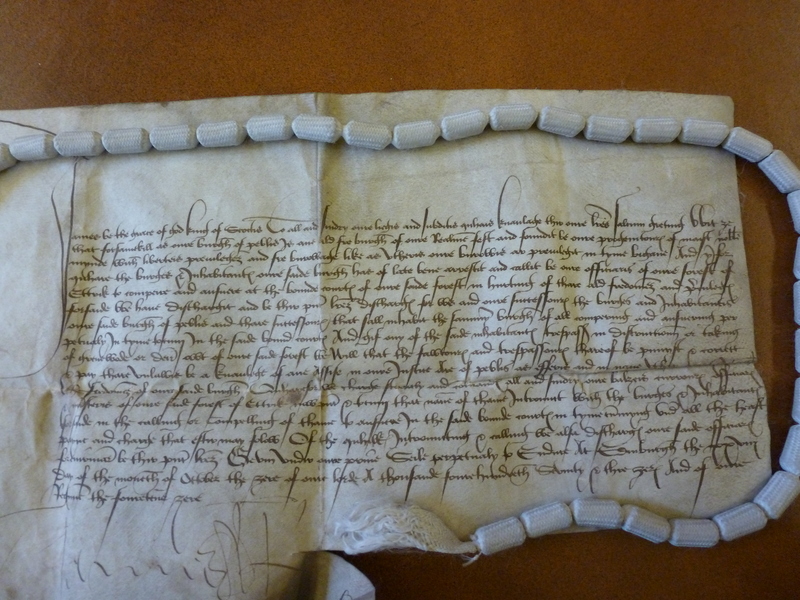 A fifteenth century document from the reign of James III. In addition to her research, Amy is the ISHR Intern, co-section editor for the Bibliography of British and Irish History (IHR), tutor on ME1006: Scotland and the English Empire (1070-1500), and is working on both a blog and a workshop for the Scotland and the Flemish Peoples Project. She has presented part of her MLitt research at the New Frontiers Conference at York University (Canada) and will be presenting papers at the Renaissance Society of America Annual Convention (New York City, March) and the International Medieval Congress, Kalamazoo (May) this year. Amy and her fellow ISHR 2nd year, Liz Hanna, will be giving papers at the last ISHR seminar of this academic year on April 17th. She has also recently been awarded a 2014 Schallek Award by the Medieval Academy of America to support a month-long research trip to Bruges and Middelburg. 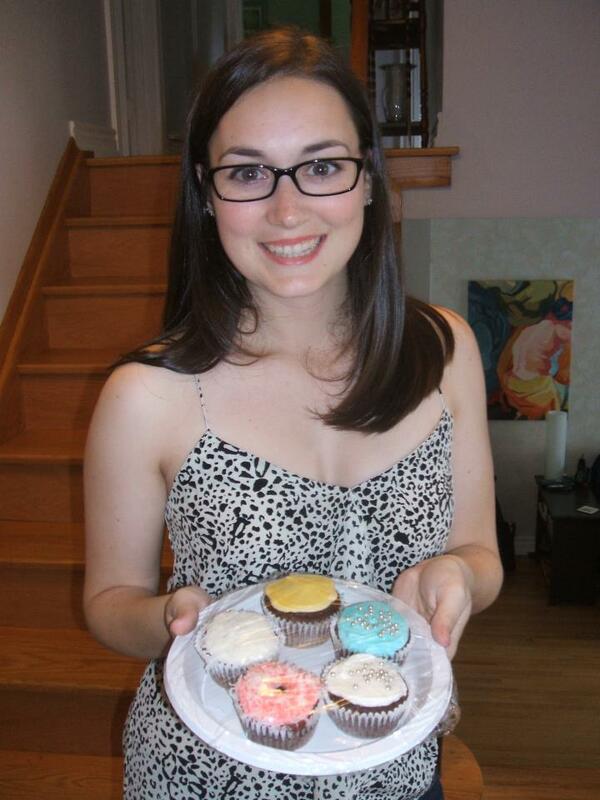 Besides her academic interests, Amy loves musicals, crime procedural TV shows, good food and sports. She is a huge fan of softball (having played it competitively) and ice hockey. You might have seen (or heard) her cheering for Canada’s hockey team in the Winter Olympics. Her officemates were subjected to more ice hockey chat than should be acceptable in a two week period. You can find her, more often than not, in the basement office of St Katharine’s Lodge (lovingly termed “The Dungeon”), listening to her music and working through her lists and networks of medieval Scots. 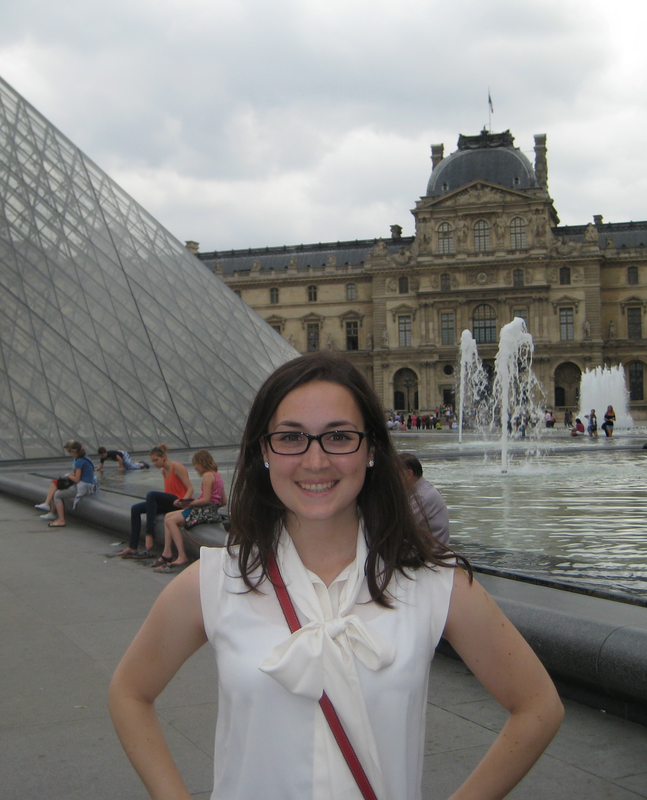 The School of History offers warm congratulations to second year PhD student Amy Eberlin who has been awarded a 2014 Schallek Award from the Medieval Academy of America. The Medieval Academy, in collaboration with the Richard III Society – American Branch, gives the annual award to fund doctoral research on any aspect of late medieval Britain. Amy’s PhD, supervised by Dr Katie Stevenson, is on the Flemings in late medieval Scotland. Her research forms part of the Scotland and the Flemish People project, hosted by the Institute of Scottish Historical Research. Amy will use her award to research in the Bruges City Archives and the Zeeuws Archief. This research which will form a core part of her thesis. The Institute of Scottish Historical Research is pleased to announce the appointment of an ISHR Visiting Scholar for 2014-15, Dr Lorna G. Barrow, a lecturer in the Department of Modern History, Politics and International Relations at Macquarie University, Sydney, Australia. Dr Barrow specializes in queenship and gift exchange associated with royal marriages in fifteenth- and sixteenth-century Scotland and completed her PhD on that topic at the University of Sydney. This is the subject her first book due for completion this year, to be published in the St Andrews Studies in Scottish History series, a publication of the ISHR. 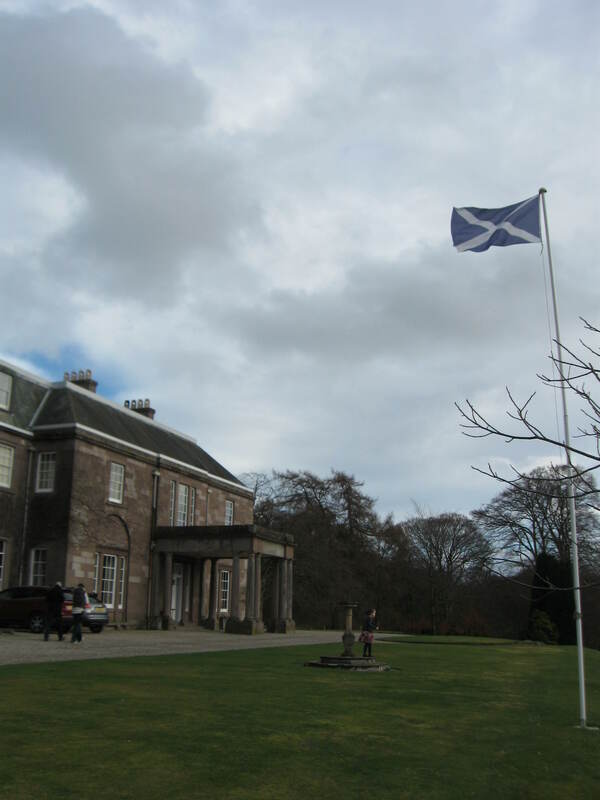 During 2008 Dr Barrow was a visiting scholar at the Strathmartine Centre in St. Andrews where she did further research on aspects of Scottish queenship. She has written several articles related to Scottish Royal women from the fourteenth to sixteenth centuries. Dr Barrow is looking forward to returning to St. Andrews later this year and will be working on research towards another book, Margaret Tudor (1489-1541) Queen of Scots: Queenship, Dynastic Marriage, Gender, Power and Politics in Early Modern Scotland. She will also be offering a postgraduate workshop on Scottish queenship, and medieval and early modern gift exchange more generally.